La Pastorela “Los Pastores a Belen” (A traditional Mexican story about Christmas) will now make a stop at the Children’s Museum of Houston. The date is this Sunday 16th of December, we will be performing at 2 PM at the Brown Auditorium. 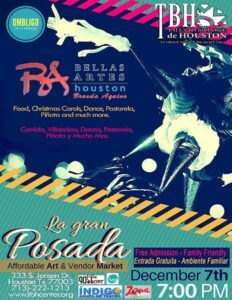 Our next production La Pastorela “Los Pastores a Belen” (A traditional Mexican story about Christmas) is part of one of the most popular events on the East End of Houston, La Gran Posada organized by Talento Bilingüe de Houston. The date is December 7th and the location is 333 S. Jensen Drive Houston, TX 77003.